Comfort House Metal Rectangle Address Plaque - - features a bold font on a traditional rectangle address sign. Free Personalization. Wall mount. Made in USA. Holds up to five (5) 4" characters, all on one line. Personalization is permanently cast into the sign. Ten colors: antique copper, black with gold characters, black with silver characters, oil rubbed bronze, bronze with gold characters, antique brass, black with white character, green with gold characters, pewter with silver characters, and red with gold characters. Small images from left to right: black/gold, black/silver, oil rubbed bronze, bronze/gold, antique brass (antique brass color shown on style Comfort House # P2834), black/white, green/gold, pewter/silver, red/gold. Alumi-Shield™ Protects against the harshest weather and environmental elements. Extends the product life and maintains the look and function. Dimensions: 11.8"W x 5.75"H x 0.325; weighs 2.2 pounds. 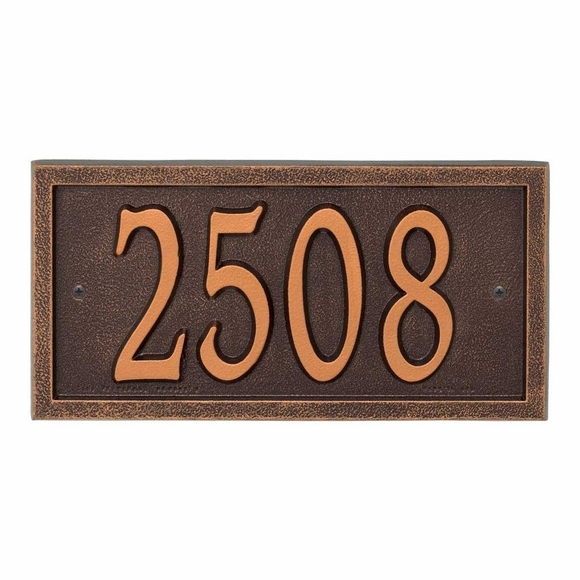 We ordered the house number plaque for our home. The quality and wrokmanship was excellent. Easy to read at night also.